This week's TT theme is one of my favourites--once again we're doing marching orders! 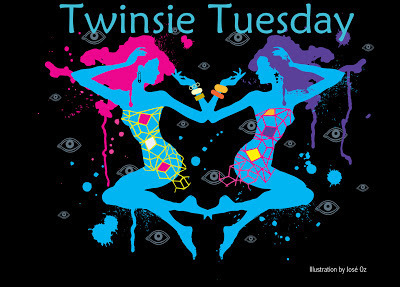 Each of us has received instructions from a fellow Twinsie, who could assign us pretty much anything she wished. My marching orders came from Rachel, of Top Coat It, who challenged me to pay homage to June 11th, also known in America as National Corn on the Cob Day! After chuckling for about an hour over this awesome assignment, I spent a few days just knowing I wasn't going to be able to pull this off. But with such a fun theme, the only thing to do was go for it...and I was shocked to find out that I'm not completely terrible at painting corn on the cob after all! Who knew?! I started with a base of OPI San Tan-tonio, and the rest is a whole bunch of acrylic paint in four different shades of yellow. I thought about adding a matte top coat but went the other way and doubled up on the shiny SV instead, because who likes dry corn on the cob? Make mine buttered! Thank you so much for such a fun assignment, Rachel! And a very Happy Corn on the Cob Day! I also want to say a huge welcome to our two newest Twinsies, Amber of Nails Like Lace, and Róisín from Cuti-CLUE-les. We're so excited to have you guys with us! 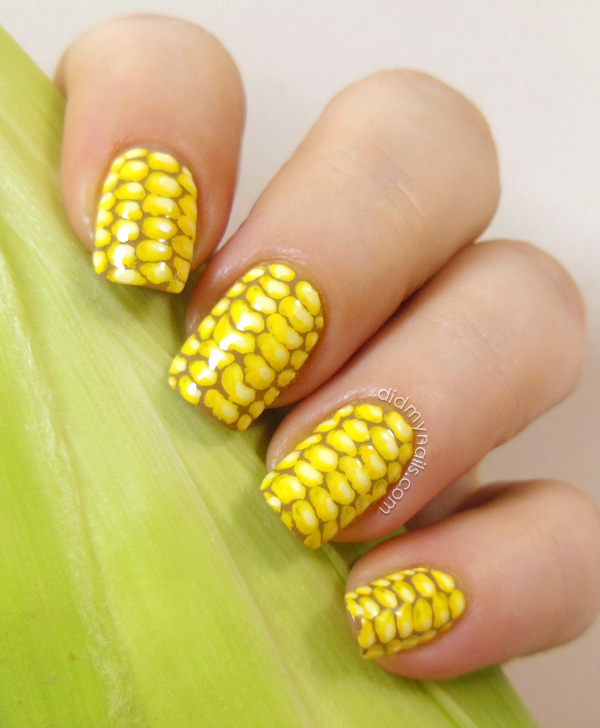 Ok these are perfect corn nails! They look so real! I don't even know where to start! So I'll start with "Like you do"! You always make me laugh out loud, after my jaw has dropped of course! 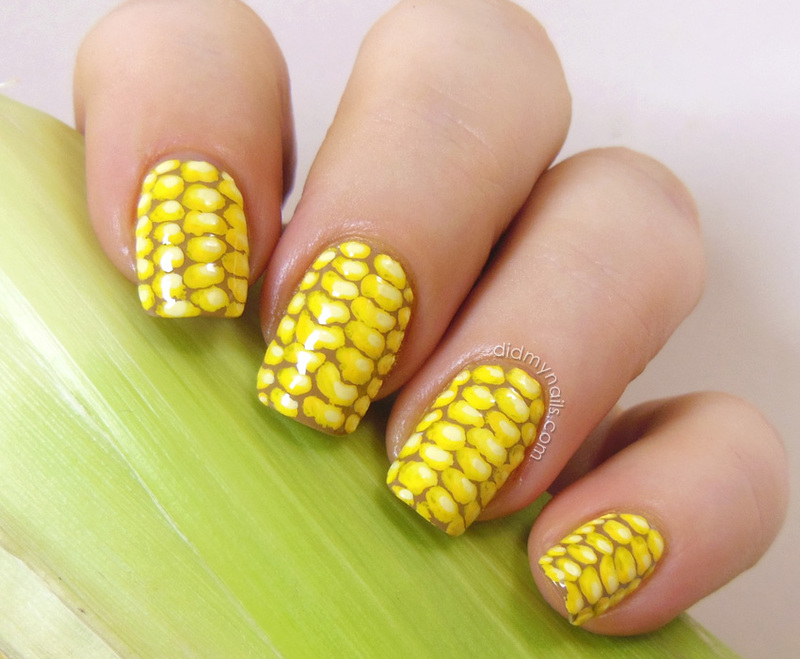 You are amazing at ALL nail art, and this corn mani is just awesome! You rock girlfriend! This is so cool. I love corn!! That is such a weird thing to commemorate haha I love your mani though! Haha this is such a fun theme! Your mani looks AMAZING too! Bwahahaha! You did great (as usual)! Cracked up when I read about the lady at the grocery store looking back and forth from your nails to the corn. LMAO. I love this! These are too cute!! I wish the corn in my garden was ready, because I definitely need to eat some, now! Haha! Love that you posed with corn! OH MY GOD, these are SO awesome!!!! LOL, I LOVE them!! Hahaha, too funny - I just glanced at the nails real quick before reading the first paragraph and I thought to myself, "Oh my gosh, Idk what she was going for, but those look like corn!!" Lol, awesome job!! I got really excited because I just had corn :P These are absolutely fantastic! You never cease to amaze me Elizabeth!! You did such an awesome job!! OMG this is freaking fantastic! Blown away! Woah, I thought these were wraps instead of freehand nailart! Well done :). These are amazing! You did an awesome job making your nails look edible, lol. Why are you just so awesome at EVERY challenge thrown at you?! This is soooo cool, you are so creative when it comes to a challenging theme! Oh. My. Gosh. These are more fantastic than I could have ever imagined! I'm glad you had fun with my crazy theme. So awesome! Wow! You have some serious talent! The corn looks good enough to eat! Omg, funniest order ever. Boy did Rachel give it to the right Twinsie. Awesome job! And you're right: corn is best with tons of butter!